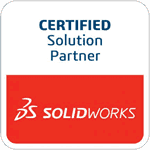 Springville, CA, January 19, 2011 ­ TEDCF Publishing, a SolidWorks Solution Partner and producer of interactive, multi-media training courses, today announced the availability of SolidWorks 2011: Mechanical Drawings. The course has over 3.5 hours of instruction that demonstrate all the commands and skills required to create professional drawings. David Melvin, PE, shows you how to customize your borders and drawings, how to use the Property Tab Builder, the best dimensioning practices, layers, and much more. Learn more about the new SolidWorks 2011: Mechanical Drawings training course.